We invite dynamic trainers with demonstrable experience, who would like to collaborate with the GODAN* (Global Open Data for Agriculture and Nutrition) Action project to build the capacity and diversity of open data users and intermediaries, leading to increased understanding and the more effective use of open data in tackling key agriculture and nutrition challenges. The grants will be provided to fund up to eight (8) winning training workshop proposals of GBP2,000. Workshops to be conducted within three months from contract date. How To Apply Proposals must be submitted by no later than 7 May 2018, 23:59 Central European Time (CET) through email to grants@cta.int. Late entries will not be accepted. Successful applicants will receive financial support for the organisation of their proposed training workshops of up to GBP2,000 (eq. Euro 2,262) that can be used toward the expenses involved in organising a training workshop (minimum 2 days) for a minimum of 20 participants. The training workshops should incorporate and address issues of weather data, land data or nutrition data, as these are the themes for the GODAN Action project. Winning proposals will be those which fall in one of the grant themes listed below and that align to the GODAN Action curriculum. NB, you can decide to address more than one use case in a theme. Weather Data: Improving capacity of national governments to release weather data as open data. Weather Data: Improving the capabilities of intermediaries to work with available weather data and to collaborate with data providers. Land data: Improving the capacity of organizations and institutions to publish land-related data and information as open data. Land Data: Improving the capacity of individuals and organisations to effectively use open land-related data. Nutrition Data: Improving the capacity of organizations and institutions to publish open data on malnutrition. Nutrition Data: Improving the capacity of individuals and organisations to effectively use open malnutrition data. The GODAN Action partners have developed a comprehensive open data in agriculture and nutrition curriculum, which guides the capacity-development activities of the project. Therefore, it is expected that the proposals should be aligned to the learning outcomes identified in the curriculum. Refer to the curriculum here. There are up to eight (8) grants each of GBP2,000 (eq. Euro 2,262) that can be used toward the expenses involved in organising a training workshop (minimum 2 days) for a minimum of 20 participants. administration costs (inclusive of fees for service providers, logistics costs, etc.). NB. The grant may not be enough to cover all the expenses, therefore the applicant may need to source additional funds from the hosting institution. In addition to the grant, GODAN Action will support the grant beneficiaries with access to the GODAN Action Learning Repository, which is a collection of learning materials, which can assist in the training activities, as well as promoting the training workshops on the GODAN website and social media. Have relevant work experience in any of the following areas: agriculture/nutrition; open data; data science; data management; ICT4D; information science or statistics and/or work in the land sector or nutrition sector. Have demonstrable experience as a trainer/educator. 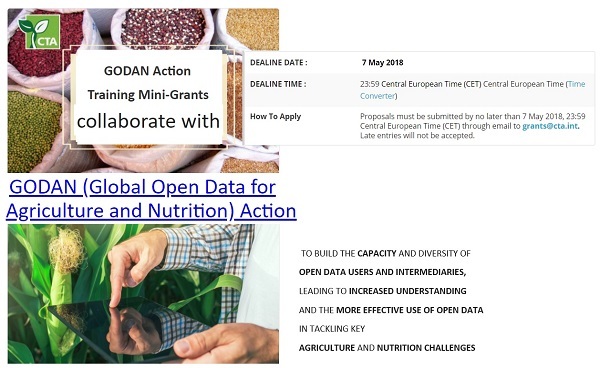 * GODAN Action project is a three-year project to enable data users, producers and intermediaries to engage effectively with open data and maximise its potential for impact in the agriculture and nutrition sectors. The project is funded by the UK Department for International Development (DFID).